MDC president Nelson Chamisa has intensified his calls for "urgent dialogue" with President Emmerson Mnangagwa on "the worsening situation and unbearable suffering" Zimbabweans are enduring, but his tactics have been questioned. Chamisa's followers on Twitter questioned the effectiveness of his tweets and his sincerity in offering solutions considering that he alongside Tendai Biti went to Washington DC in December 2017 and called for stiffer economic measures against Zimbabwe by the US government. 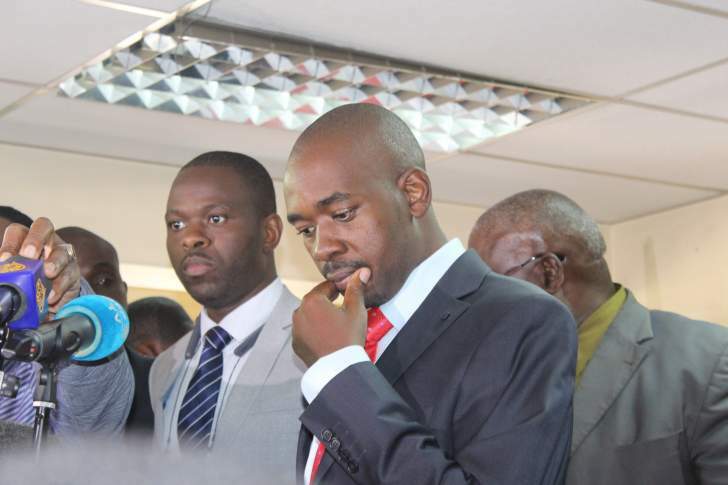 Asked what other efforts have he has done outside twitter to engage with President Emmerson Mnangagwa, MDC leader Nelson Chamisa said: "I have written letters (to President Mnangagwa) without a reply before and after elections. 1)I have written letters without a reply before and after elections. 2)I have met with potential mediators in the church. "I have met with potential mediators in the church. I have engaged leaders in SADC and the African Union and also made a public statement of invitation for dialogue." When reminded that President Mnangagwa had offered him a position in government as the leader of opposition party in Parliment last year and that he (Chamisa) rejected that offer, the opposition leader said: "It's not about individual positions. I am not interested in. "My concern is about the well-being of Zimbabweans through a political solution focusing on key economic and political reforms." He lamented the deteriorating economic situation and said it all pointed back to politics. "I've met with many on our worsening situation and unbearable suffering. The back-to-school burden,high prices,non-performing economy, joblessness and worthless salaries bring sorrow. "On this, I call upon my brother Emmerson Mnangagwa to urgent dialogue to solve our politics and economics or it gets worse!" Chamisa said. Chamisa's call comes as churches working under the banner of the Zimbabwe Council of Churches (ZCC) have offered to provide a framework for President Emmmerson Mnangagwa and opposition leader Nelson Chamisa of the MDC to come to the negotiating table as the economic crisis worsens. ZANU-PF, whose initial offer for dialogue was spurned several times by Chamisa, has continued rebuffing the opposition leader's calls for talks, saying he lacks maturity. "We can choose the route of engagement or the route of conflict, the route of individual solutions or that of a shared vision, the route that entrenches greed or one that leads to the common good. As the Church of Jesus Christ, we serve as a sign of hope by being truthful in looking at the current challenges and their root causes," ZCC said in a statement yesterday. Shortly before the July 30 polls, the Catholic Church made similar offers as they anticipated a disputed outcome. Mnangagwa, on the other hand, has rebuffed the MDC leader, saying he does not talk to losers. "We also remain committed to proffering solutions which are inclusive, realistic and sustainable. The church, therefore, commits to create a shared space for a collaborative national consensus building process aimed at creating a space of trust in which all Zimbabweans can shape a new national imagination." Zimbabwe is facing civil servants restlessness as the workers lament erosion of their salaries by the effects of currency distortions in the market. Doctors have been on strike since 1 December 2018, although some have since returned to work. Teachers had threatened to abandon their workstations on opening day yesterday, but the majority of schools across the country opened with no incidences. Teachers' unions have been calling for government to review their salaries to match the rate of bond note against US dollar on the parallel market, or to pay them in US dollars. Government says it is not able to pay salaries in US dollars, as 98% of its revenue is in RTGS balances.